Golden Technologies Compass sport GP605SS power wheelchair with van / pan seat features a sleek new design to the shroud and a single post seat mount. It includes a height-adjustable single seat post mount supporting the same two-tone stadium style as the original golden compass. 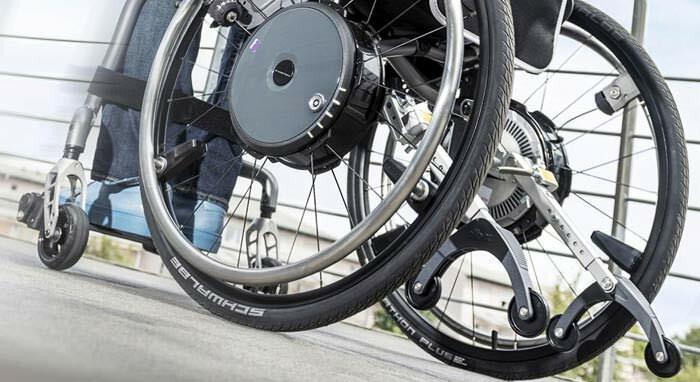 The compass sport power wheelchair builds on the best features of the original Compass wheelchair by including center-wheel drive, articulating frame for outstanding obstacle climbing and maneuverability, and six wheels on the ground at all times for the most stable ride. Rear (Flat free tire) 10"
Casters (Flat free tire) 6"
Seat width x depth 18" X 18", 20" X 18", 20" X 20"
Ground clearance to transaxle/motor 3.25"
Height (back of seat) 40" - 42"
Height (back of headrest) 47" - 52.5"